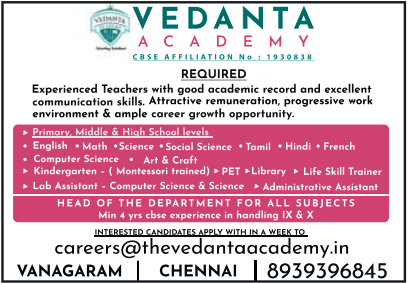 Vedanta Academy ,Chennai ,Tamil Nadu Advertised in The Hindu paper for the Teachers recruitment 2019 – Teaching Jobs / Non Teaching Jobs. For More Details see below. About School: Vedanta Academy is located at Vanagaram in Chennai and it follows CBSE curriculum. This school follows two terms in a year. Class rooms are very spacious, air conditioned and interactive smart class enabled and integrated with TATA Class edge curriculum to understand the concepts better. Vedanta Academy accommodates maximum 35 students in pre-primary classes with two teachers and 40 is the maximum for remaining grades. Well established science labs (like physics, chemistry, biology), computer science lab, math lab, library are some of the facilities available in Vedanta Academy. Medical attention is given to students immediately if needed, by Apollo Infirmary run by Apollo Hospitals and Nursing. Offices will be available in school during working hours. Art and craft classes, music classes, karate and skating are some of extra-curricular activities available for students after school hours. Transportation facility is provided by school from various parts of the city.